Kingdom Defense 2: Empire Warriors – Best Tower Defense game in 2018. This Tower game is a whole new level of the gameplay and the strategy! Get ready for an epic journey to defend your empire against all the monster in the world like hordes of orcs, evil wizards and and more. 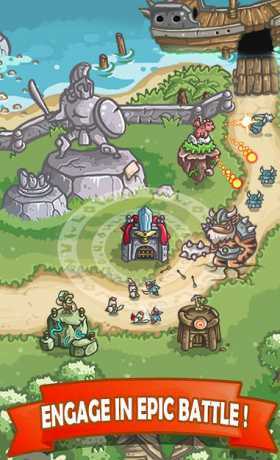 The Defenders have to use a vast arsenal of towers, heroes, Knight and spells at your command! Rain fire upon your enemies, command your troops, summon reinforcements, recruit warriors and face legendary monsters on a quest to save the Kingdom from the forces of darkness! Deploy rapid-fire archers! Carve walls on the map with magic beams! Fire roaring cannons! Summon allies! Empire Warriors offers variety and challenge. This TD game is based on missions on a attractive map of Empire. Adventure through lush forests, gold land, snow covered mountains, and epic desert as you face off against armies of slimes, goblins, skeletons, wolfman, Orc and more. All you have to do is defend them, make a epic battle conquer the world with Heroes and magic. Empire Warriors with five basic tower systems including Archer, Knight, Ston God, Magic Dragon and Gold Tower. Each tower has its own functions and strengths, which can be defeat the specific types of monsters and support heroes. Tower system can be upgraded to 4 levels, gain more power and magic, help you win the battle! Specially, the tower system is also upgraded by the stars that you gain in each battle, you can customize each tower with each of the various enhancements such as increasing power, reducing countdown time, etc., you can reset it with each battle when applying different strategy. The special feature in this TD game is the heroes system. This is the perfect combination of strategy game and Role playing game. 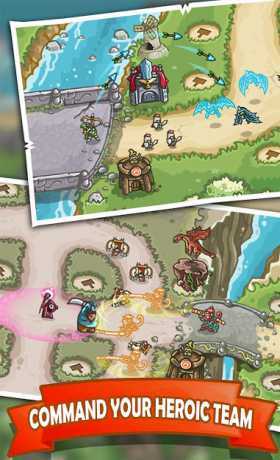 Unlike ordinary Tower Defense, Empire Warriors gives you a more fun and exciting gameplay style. 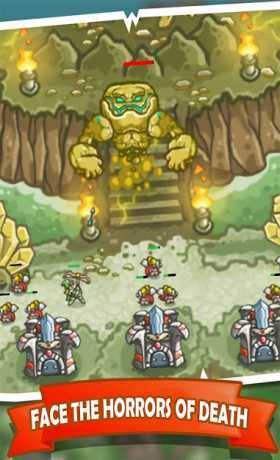 You will not only build tower, but also summon heroes and command heroes in epic battle. Empire Warriors has a variety of heroes, such as Galahad, Ashi, Wukong, etc., with special skills that will help you win! Heroes will be challenged by many mode in this Kingdom Defense, they will have to use the different strategy to win in different mode. More challenges in Daily trial mode and Tournament, and of course you will get the deserving prizes! The magic items such as meteor strike, frost gem, healing ward or Gold chest will help you win each battle! Kingdom Defense 2 – Empire Warriors will give you an exciting experience. You have to not only have good strategy in each battle, but also need to control the heroes skillfully and quickly.